Obituary for Richard Swearingen Gracy, Jr.
Richard Swearingen Gracy, Jr., 88, passed away peacefully on March 23, 2019 at his home in Austin surrounded by his loving family. He was born September 11, 1930 in Austin, Texas to Richard S. and Helen Wiginton Gracy. He grew up on the family farm in North Austin in an area now known as Gracy Woods. He is survived by his beloved wife Mary Gayle Walker Gracy of Austin. Dickie was a lifelong dairyman and after graduating from Austin High School in 1949 he attended Texas A&M University. 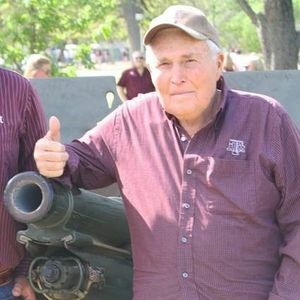 As a member of the Fightin' Texas Aggie Corps of Cadets, "A" Company Athletics he played football for the 1949 A&M Fish Football Team and helped shutout the highly favored t.u. shorthorns that year. He was favored for the 1950 varsity football squad at A&M but after learning his father fell ill he returned to his home in Austin to run the family dairy. He later served on the Pflugerville school board from 1967-1982. When the homes in Gracy Woods started closing in he closed the dairy and made a move where he later found his true passion, his and Mary's exotic animals at their ranch in Henly, TX. He had many exotic animals which included addax, oryx, elk, blackbuck, axis, waterbuck, llamas, zebus, and his favorite, the zebras, especially Jenna. He is preceded in death by two children, John Lance Gracy and Kathy Lynn Gracy; and his parents. He is survived by three children, Rick Gracy of Austin, Debra Gracy of Boerne and Matthew Gracy and wife Annette of Midland. Surviving grandchildren are Sheri Walls of Boerne, Nicole Brooks and husband Nick of Kingsland, Ryan Gracy of Austin, Lance Gracy of San Antonio and Kyle Gracy of Dripping Springs. Surviving great grandchildren are Mason, Avery, and Owen Brooks and Marshall Walls. He is also survived by his extended family of Judy and Tim Lee of Austin, Russell and DyAnna Robinson of Lexington, Dylan "The Mouse" and Katie Lee of Magnolia, Rustin, Kacee, Railey and Rennan Robinson of Lexington, a special sister in law Linda Walker Walden of Buda, niece Teresa Stephens of Buda and very special friends, Danny Turner and his wife Brenda of Johnson City. Pallbearers are Dylan Lee, Rustin Robinson, Danny Turner, Jake Walls, Kyle Gracy, and Richard Webb. Visitation will be 5:00 pm-7:00 pm on Thursday, March 28 at Weed-Corley-Fish Funeral Home. Funeral services will be at 11:00 am Friday, March 29, at Weed-Corley-Fish Funeral Home with interment following in Oakwood Cemetery. In lieu of flowers, memorial contributions can be made to the Texas A&M Veterinary school in his name.